It is still dark when the battered white van loads up in Freetown, Sierra Leone's humid coastal capital. In the minutes before dawn, the only other presence on the streets is a cloud of hungry mosquitoes. After a 20-minute crawl over tyre-busting rocks and around dozing dogs, the truck pulls up on the beach at the village of Goderich, where a group of fishermen wait for its precious cargo. 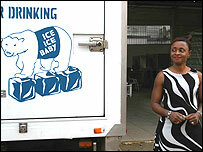 Children wandering on the streets repeat the words painted on the side of the van like a mantra: "Ice Ice Baby". 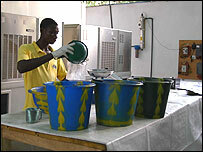 Every morning the ice factory - named after US rapper Vanilla Ice's popular tune - transports up to 200 bags of freshly-flaked ice straight from the factory in Freetown to the fishermen at Goderich. The ice sells wholesale for 15,000 leones ($6; £3) per bag, and delivery is free and right to the shore. Not only has the company captured the imagination of nearby residents, it has also captured the wallets and hopes of local fishermen. "Last season the fishermen struggled with ice because there wasn't enough," says agent Nabi Youla. "No boat strains for ice now." About 800 boats are anchored at Goderich, and young fishermen carry the 28kg ice bags on their heads out to brightly-painted wooden skiffs, emblazoned with requests to God to protect them at sea. The waters around Sierra Leone are some of the richest in the world, teeming with snapper, grouper and barracuda, as well as shrimp and lobster. But a catch is only valuable for as long as it stays fresh. "At times you catch a lot, sometime you come back with nothing," says fisherman Eldred Williams who buys six or seven bags of ice every time he goes out..
"But without ice the fish would spoil." The mass deliveries mean the fishermen can stay longer at sea, saving on fuel costs for their engines, travel further afield to chase large shoals, and earn a much better price for a fresh catch rather than sell the fish to be smoked. "Before, they would go in the morning and come back in the evening if they couldn't get ice," says Marie Garber, general manager and co-owner of Ice Ice Baby. "Now they go for three or four days and they can preserve their catch at sea with our ice." Born and raised in Sierra Leone, Ms Garber went to Canada in her late teens. She returned for good in 1995, determined to put some of her self-taught business skills to good use in a country that is still struggling to return to normal, five years after a brutal civil war that lasted 11 years. After receiving enormous amounts of international aid that account for half the government budget, and following recent debt relief, some say the country is becoming dangerously accustomed to external support with few incentives to spur the private sector. Ice Ice Baby shows that, despite the hindrances, it is possible for a small local business to spot a gap in the market, turn a profit, and to support development. "What we found is that even after the additional cost of ice, the income of fishermen is doubled," says Tom Cairnes, partner of the $5m Sierra Investment Fund, which has done research into the business and is preparing to make private equity investments in Sierra Leone in April. "That has a number of strong development impact," he says, insisting it can help pay for school fees and healthcare. "To me that's what sustainable development is about, rather than lots of handouts and aid. 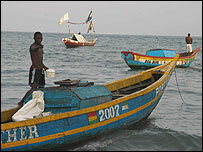 "Even poor Sierra Leonean fishermen have the ability to deliver economic growth themselves." Ask the fishermen on the shore, however, and they still complain that the ice is too expensive and melts too quickly. Ice Ice Baby is all too aware of the problems. Since dry ice lasts longer, the firm needs a blast freezer. It has a $200,000 shopping list to import such a machine and other equipment to expand the capacity and quality to meet growing demand. Coca-Cola has signed a three-month trial contract to supply its agents with ice daily, while Senegalese fishermen regularly stop off at Lumley beach in the capital to pick up their share of the cold stuff. On a good day, the company can sell enough ice to take home 8m leones. The company also produces up to 15 tonnes a month of ice cubes made from filtered water, sold for 3,500 leones a 3.5kg bag. These are snapped up by local hotels, beach bars, restaurants and supermarkets - all keen to supply the thirsty gullets of well-to-do Sierra Leoneans and the large numbers of expatriate development workers and UN staff stationed in Sierra Leone with ice-cold beers and soft drinks. Ice Ice Baby opened its doors in August 2006 to utter disaster. 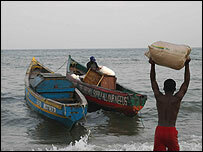 It was the middle of the rainy season, when fishermen stay onshore and so do not need ice. The business lost 160m leone in its first three months. But in such a backs-to-the-wall business, both Ms Garber and her business partner Rhoda Joseph had sunk everything they had into the firm. They spent more than $450,000 alone on start-up costs, including building the factory from scratch. Those with a weaker stomach might have decided to cut their losses, but here there was no option. "I never thought about closing," says Ms Garber. "This business is my life savings." In the face of the calls for lower prices, Ms Garber would love to oblige. But Freetown remains a city without electricity. Residents consider themselves lucky if they get power from the National Power Authority once every 10 days. Like many companies, Ice Ice Baby has to run a generator 24 hours a day. The 150 gallons of diesel required to keep the business functioning costs £388 a day at current prices. With bank loans attracting interest rates of between 24% and 28%, and with no tax breaks or start-up grants from the government, such expenses simply have to be passed on to customers. "We've created jobs and contributed to the community but we don't even get anything as basic as light from the government," says Ms Garber, who feels more could be done to support entrepreneurs. "A lot of Sierra Leoneans have money but they take their money out of the country. "You can't really blame them when you look at the help you get from government here." Is Africa open for business?